Who doesn’t like a good snow cone now and then? For some reason, it never occurred to me before that it is actually pretty simple to make them at home. I was brainstorming some fun summer desserts to make for the 4th of July when I had the delicious idea to attempt homemade snow cones. Before we discuss syrup recipes, let’s talk about ice crushing options. I generally like to avoid buying unnecessary kitchen appliances, however, I figured out through trial and error that an ice shaver or snow cone machine would make the whole process so much easier. 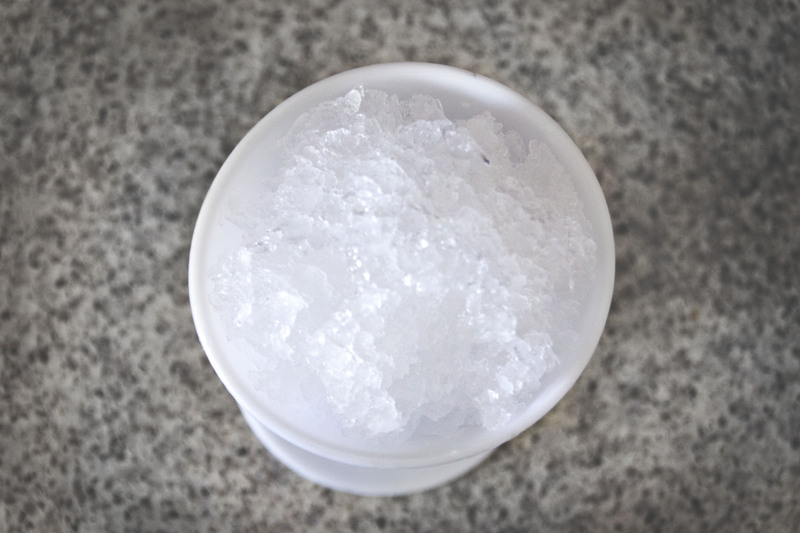 I attempted to simply crush ice in a blender, but the ice pieces wouldn’t get any smaller than medium-large pebbles. I read a tip online about adding water to the blender to help break up the chunks, however, the ice turned into a melty slush by the time enough water was added to really help the blending process. That was a disappointing result, to say the least. I was able to somewhat perfect the blender method by blending the ice in very small batches, but come on, ain’t nobody got time for that! My options at that point where to 1) give up entirely, or 2) break down and purchase an appliance that would actually allow me to enjoy the snow cones that I was so craving. I went with option #2, and I bought this ridiculous looking snow cone maker. I’m not a fan of the cutesy carnival appearance, but my decision to go with this machine was because of features and reviews. First, it makes larger batches of snow than a lot of the other machines. Several of the ones that I looked at only made 2-3 servings at once, if that. Second, this snow cone maker doesn’t require any effort from the operator at all. Some of the shaved ice machines require pressure to be applied to the top, (even some of the electric versions require this). Third, the product reviews for this machine are excellent. Overall, I’m happy with my choice. The ice is definitely snow cone texture rather than a shaved ice texture. Operation is quick, easy, and consistent. As for the syrup, I wanted to try a few different things. I bought a bottle of snow cone syrup from the store, just to try it. I also made a couple of flavors using a 3-ingredient recipe that uses Kool-Aid for flavoring. I also decided to try making an all natural version using real berries. All three were enjoyable to different degrees. 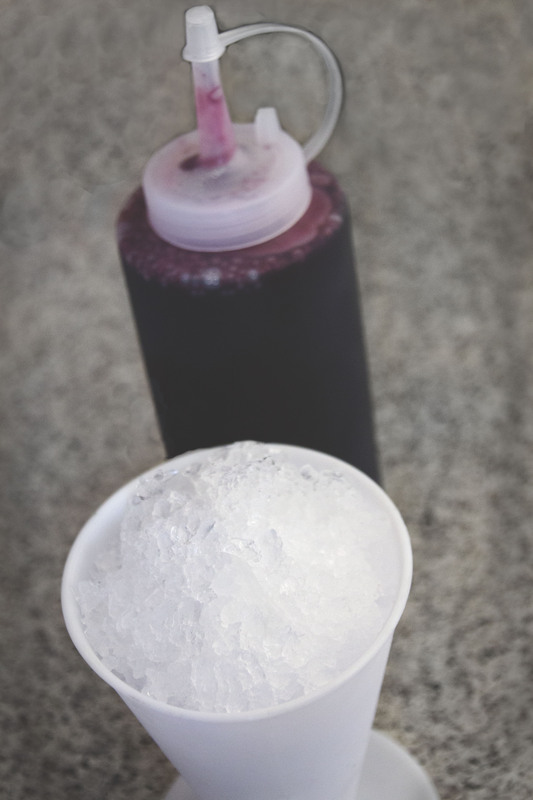 With the store bought and the Kool-Aid syrups, there was that artificial, syrupy sweetness that we’re all so familiar with, which is pretty typical with snow cones. The homemade blue raspberry syrup tasted more like, and was cooked in a very similar fashion to, homemade jam. Enjoy the recipe below! Add all ingredients to a medium-sized pot. Smash berries with a potato masher as best you can. Bring to a boil, reduce heat, and simmer 2-3 minutes. Remove from heat. Blend with an immersion blender, or transfer syrup to a blender and process until smooth. Use caution when blending hot liquids! Syrup can also be cooled before blending, if desired. Strain syrup through a fine mesh sieve. Discard solids, and cool syrup to room tempurature. 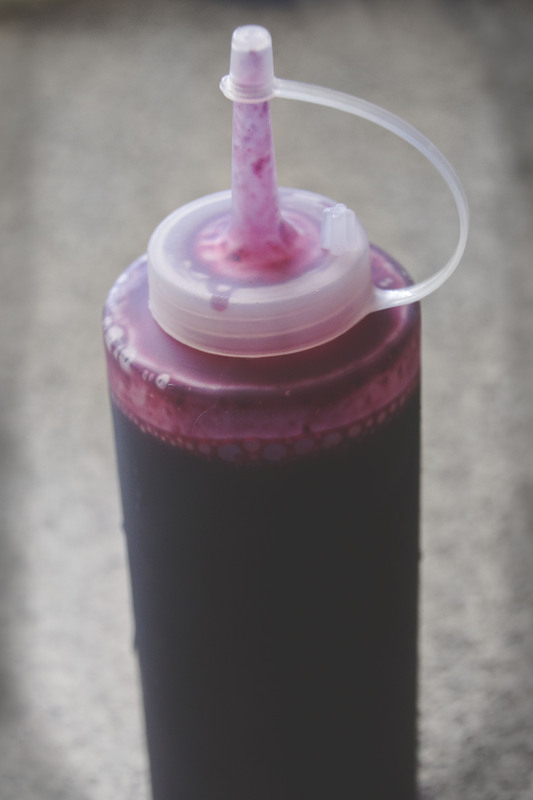 Use a funnel to pour syrup into a squeeze bottle. Store in the refrigerator for up to one week. This syrup recipe is only one of many fun options! Liven up an adult party by making snow cone cocktails, or even use your favorite beer to make cubes in place of plain ice!